Bridge to Terabithia By: Sophia Locker. 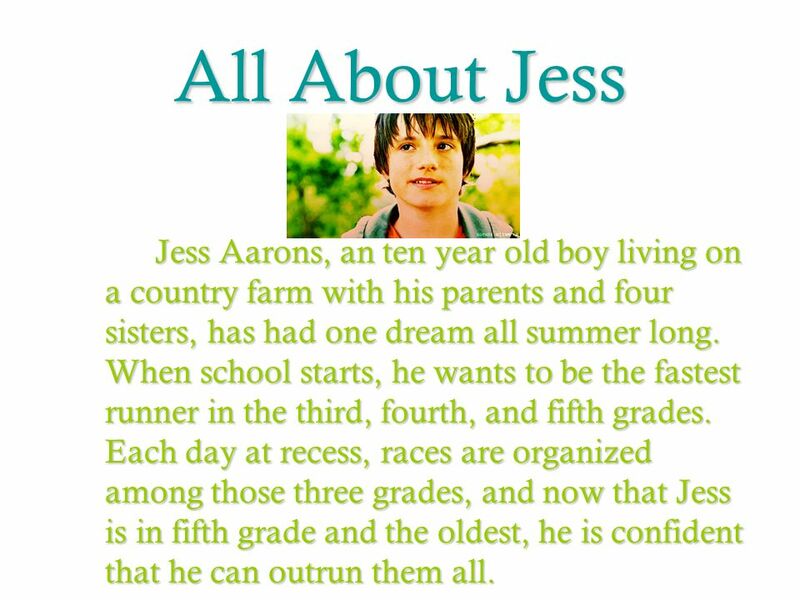 2 All About Jess Jess Aarons, an ten year old boy living on a country farm with his parents and four sisters, has had one dream all summer long. When school starts, he wants to be the fastest runner in the third, fourth, and fifth grades. Each day at recess, races are organized among those three grades, and now that Jess is in fifth grade and the oldest, he is confident that he can outrun them all. 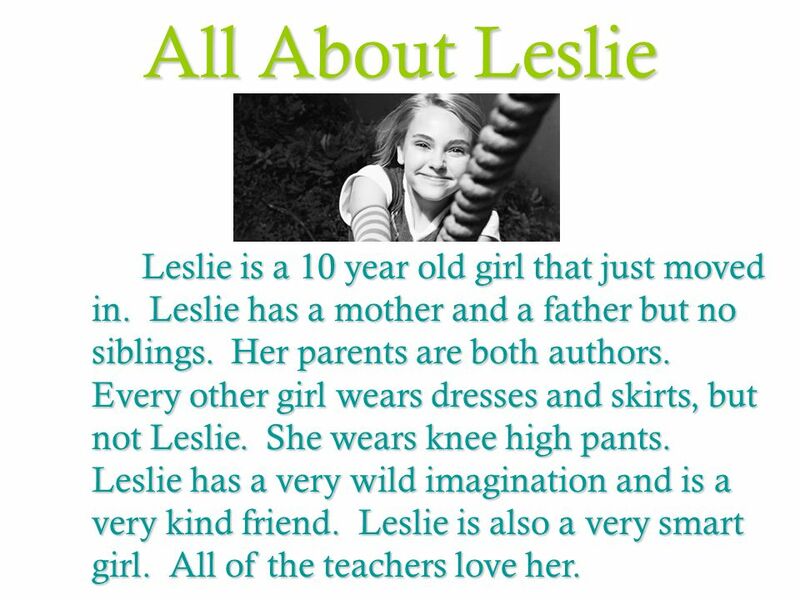 3 All About Leslie Leslie is a 10 year old girl that just moved in. Leslie has a mother and a father but no siblings. Her parents are both authors. Every other girl wears dresses and skirts, but not Leslie. She wears knee high pants. Leslie has a very wild imagination and is a very kind friend. Leslie is also a very smart girl. All of the teachers love her. 4 How Jess and Leslie Met At first Jess didn’t like Leslie. Leslie moved into Jess’s neighbor’s house, that he calls the old Perkin’s place. When Jess was on his way to milk Miss Bessie, the Aaron’s cow, he saw Leslie for the first time sitting on the fence. Jess was very surprised on Leslie’s outfit choice because most girls wear dresses and skirts, but she wears knee high pants. Leslie was curious about Jess and she wanted to be friends with him. 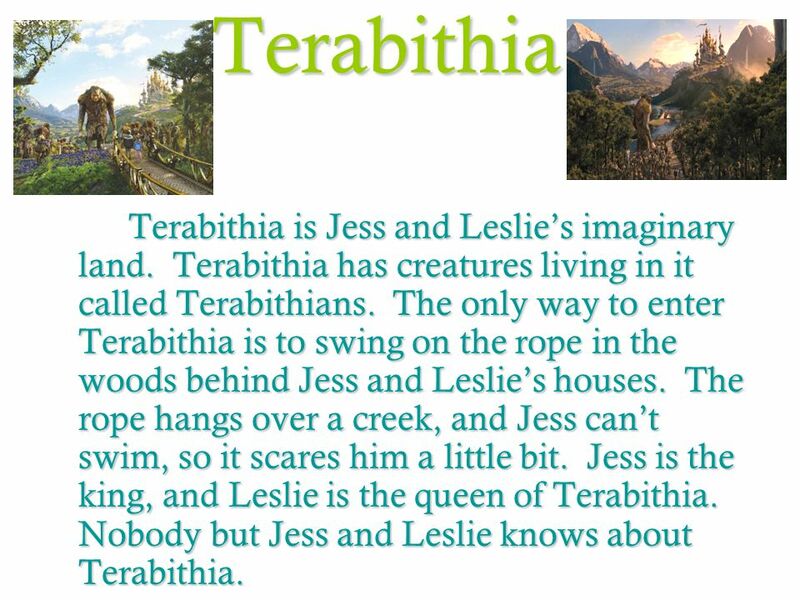 5 Terabithia Terabithia is Jess and Leslie’s imaginary land. Terabithia has creatures living in it called Terabithians. The only way to enter Terabithia is to swing on the rope in the woods behind Jess and Leslie’s houses. The rope hangs over a creek, and Jess can’t swim, so it scares him a little bit. 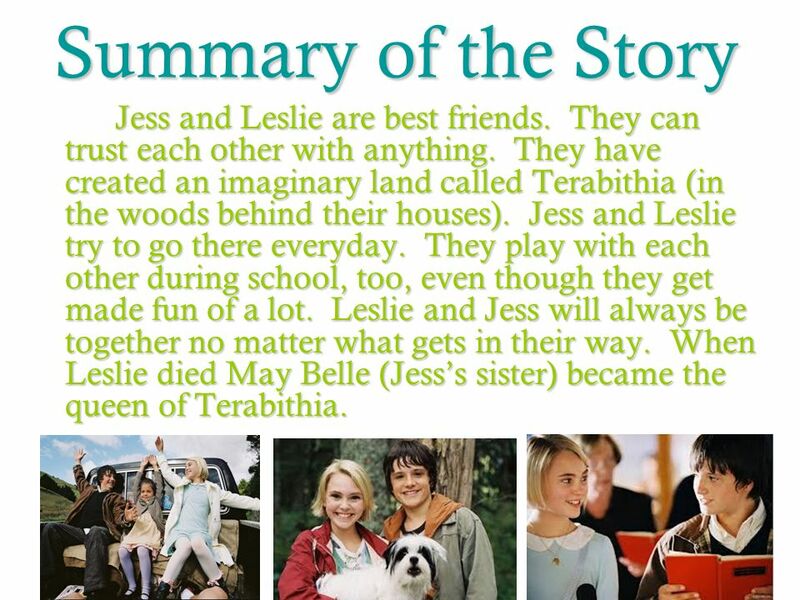 Jess is the king, and Leslie is the queen of Terabithia. Nobody but Jess and Leslie knows about Terabithia. 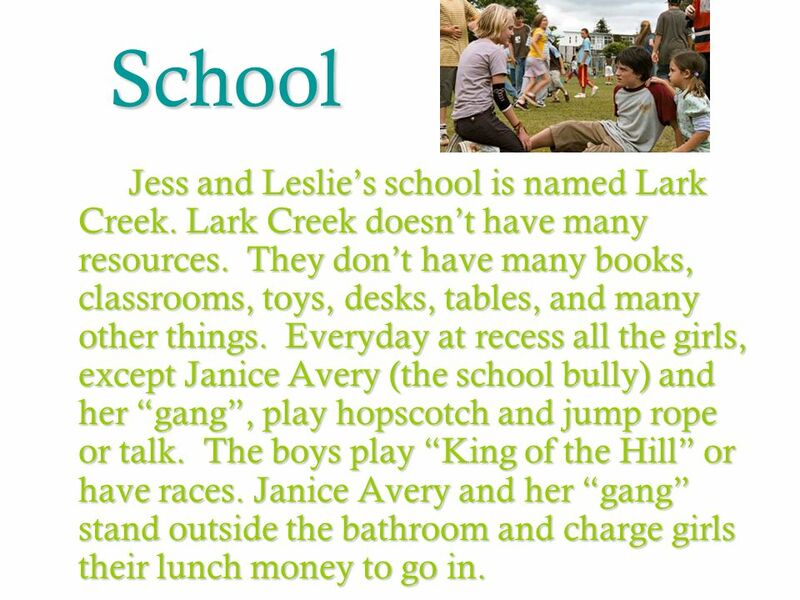 6 School Jess and Leslie’s school is named Lark Creek. Lark Creek doesn’t have many resources. They don’t have many books, classrooms, toys, desks, tables, and many other things. Everyday at recess all the girls, except Janice Avery (the school bully) and her “gang”, play hopscotch and jump rope or talk. The boys play “King of the Hill” or have races. Janice Avery and her “gang” stand outside the bathroom and charge girls their lunch money to go in. 7 How Leslie Died It was a special day for Jess but not for Leslie. Jess had gone to an art museum with his music teacher, Miss Edmunds. He was having a blast! Meanwhile Leslie was on her way to Terabithia. It was a rainy day so the creek was high and had a strong current. Leslie was swinging on the rope when it snapped! She fell into the water and drowned. They found her later that day up stream dead. Everybody was devastated (especially Jess). 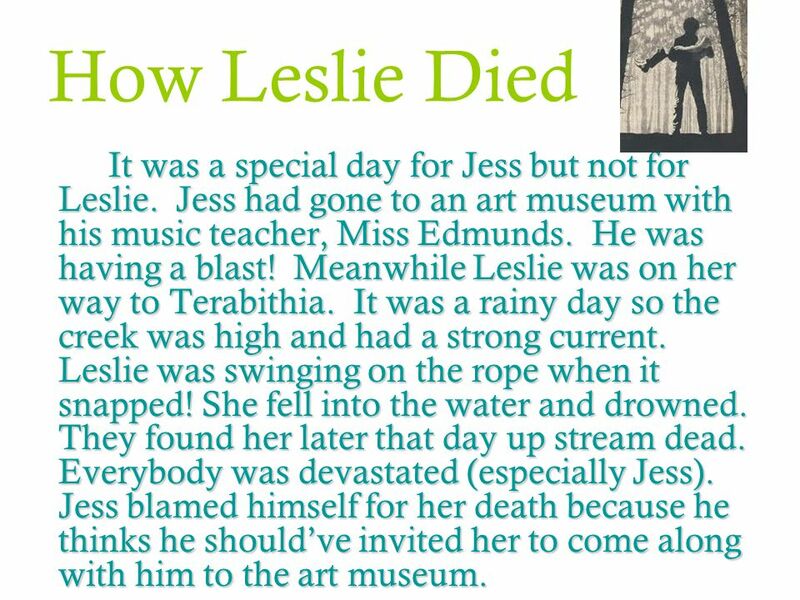 Jess blamed himself for her death because he thinks he should’ve invited her to come along with him to the art museum. 8 Summary of the Story Jess and Leslie are best friends. They can trust each other with anything. They have created an imaginary land called Terabithia (in the woods behind their houses). Jess and Leslie try to go there everyday. They play with each other during school, too, even though they get made fun of a lot. Leslie and Jess will always be together no matter what gets in their way. When Leslie died May Belle (Jess’s sister) became the queen of Terabithia. 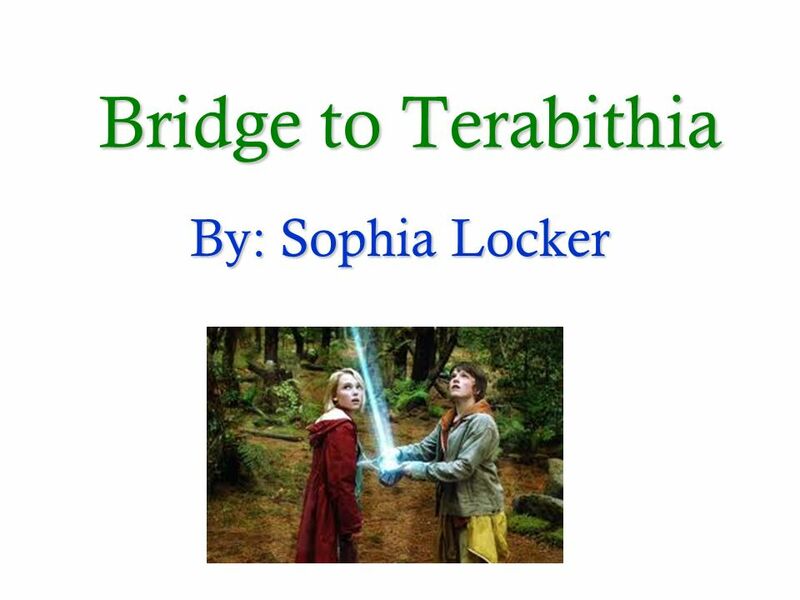 Download ppt "Bridge to Terabithia By: Sophia Locker." By Karla Dixon This story is about a little girl named Matilda. She is very smart, she has two mean parents that dont really pay any attention to her. Bridge to Terabithia Chapters Questions. TThe story takes place in New Jersey where Steven Alper lives with parents and his little brother Jeffery. It also takes place in Philadelphia at the. By: Jack O. Hope you enjoy!!! Find the Commentary Sonia starts hanging out with the Latin Kings gang. I believe she was really dumb. In a way I understand her though because she wanted. Response to Literature Beauty and the Beast. Introduction: In the story, Beauty and the Beast by Jean Cocteau, the author’s message is don’t judge a person. Bedrock Word Phrases Grade 1 After you have learned all your Bedrock sight words, practice these phrases to keep them fresh in your mind. Your teachers. What do I do? 1. Read each scene. 2. Choose what you would do. 3. Read what happens next! 4. Try different choices when you get done! Mrs. Hayman’s Second. Bridge To Terabithia Chapters 8-10 Questions. Bridge To Terabithia Chapters 5-7 Questions. PLAY Meiad Ahli H EDU Types of play. The Cay Sadie Sarinske 6th grade reading hour 4 February 2nd Final Project Sadie Sarinske 6th grade reading hour 4 February 2nd Final Project. Written by Katherine Paterson A Third Grade Literature Project Presented by: Damian October 16, 2014 Bridge to Terabithia.